Mexico accounts for more than 18% of the auto production in North America and employment in the auto industry there has increased by over 46% since 2009 to nearly 580,000 jobs. On Friday, at the new Celaya, Mexico $800 million plant, Honda’s first Fit rolled off the assembly line, another symbol of the growing presence of the auto industry in the country. Factories in the U.S. operated by Honda produced hundreds of thousands of Civics and Accords annually. However, when the Fit was redesigned by the Japanese automaker for the North America market, it turned to its Mexico plants for its favorable rules for exporting and exceptionally skilled workforce. The 18% current rate of auto production for North America is expected to increase by 2020 to 25%, as other carmakers pour hundreds of millions of dollars into Mexican factories said one automotive industry analyst. Auto factories in the U.S. have moved up the pace since the financial crisis and recession, as sales for autos has rebounded. However, the plants in Mexico are adding new jobs at an even faster rate. The auto industry in Mexico has gained 46% since 2009, while the industry in the U.S. has gained 16% over the same period. Other manufacturers in the U.S. especially those in industries of high-value, such as electronics and aerospace will also see more competition from the industrial ascendance in Mexico, said analysts. Mexico has also positioned itself as a worldwide player in manufacturing high-tech items. The federal government of Mexico boasts that over 100,000 Mexicans graduate annually prepared for lifelong careers in technology and engineering. In particular, the aerospace industry has boomed. In 2012, exports were over $5 billion, an increase over 2011 of 16%. Honeywell and General Electric have developed new turbines, while many companies build new engines in the high-tech factories of Queretaro in the central region of Mexico referred to as El Bajio. Bombardier, the aircraft company, has rapidly increased its production of major components for aircraft in factories located in Mexico. 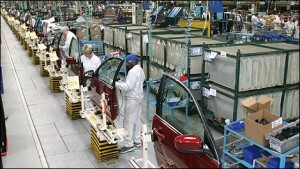 However, it is the auto industry that leads the charge, thanks to low wages, high quality and high productivity.